bailey is so excited that another nfl season is underway. (i think it's because she likes her cheerleader dress). in the season opener, the denver broncos took on the carolina panthers. (the broncos had previously beat the panthers in super bowl 50, 24-10). in the final seconds of last night's game, the panthers tried to kick a winning field goal, but it went wide and, once again, the broncos came out victorious over the panthers, 21-20. go broncos! 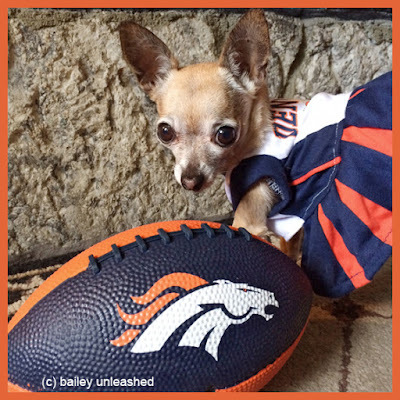 Labels: bailey, broncos, cheerleader, photo by j.
I also like your dress, think I's one of the cutest that you have. You look adorable as always.